Because all diets are based on a few very simple variations of the basic average American diet, the diets that have been recently popularized have actually been around for 50 years or more and every so often they have renewed popularity. An excellent review of an amazing variety of diets was presented in the book, “Rating the Diets,” by Theodore Berland and the Editors of Consumer Guide, published by Consumer Guide (Stokie, Illinois), Volume 77, April 1975. This guide reviews, in detail, many popular diets, including Dr. Atkin’s, Dr. Stillman’s, Mayo, Prudent, Zen, Simeons, Kennedy Hormone Diet Program, Cellulite Diet, Boston Police Diet, and many other diets. This review by the Chicago Tribune health columnist, Theodore Berland, is extremely well written and comprehensive. It is also extensively referenced with early scientific articles describing studies of many of these diets. Many of these articles have been forgotten, but they are still relevant and scientifically pertinent. In my opinion, all diets are viable if they are healthy – for both the short-term and the long-term. People are different and they tend to gravitate to diets that fit their life style and basic tendencies. I will only address the diets that are made up of different macronutrient contents, as these are the ones that are most often written about in books and in magazine articles. In Chapter 7, I discussed the “Dietary Goals for the United States” that was released by Senator George McGovern’s committee, and the subsequent Dietary Guidelines released a few years later. 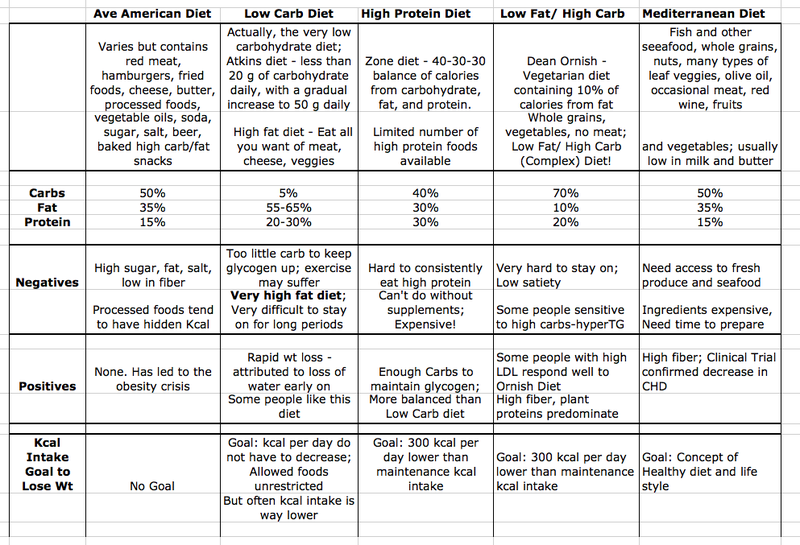 I included a table that presented the macronutrient breakdown of diets from a wide range of human societies. This table illustrated the point that human groups were and are highly adaptable to different dietary macronutrient mixtures. In the next table, I have compared the different main diets that rely on variations in macronutrient content that are popular today. In the left most column is the typical American diet as described by the USDA. In the second column is the low carbohydrate diet that is also called the Atkins Diet. In the middle column is the Zone high protein diet that many students in my class who are weight training adhere to. The fourth column is the very low fat diet, which is essentially a high unprocessed carbohydrate diet. And the fifth diet is the Mediterranean diet, which was first proposed and written about by Ancel Keys. The low carbohydrate diet has been around for many years but has recently become popular again. It is predicated on the concept that high intakes of carbohydrates are obesogenic because they lead to an increased insulin level, which supports energy storage over utilization, and extremely low carbohydrate consumption prevents this. This is a complex metabolic issue and I will not discuss it right now. A very important distinction here is that I am talking about the very low carbohydrate diet, where carbohydrate intake is at first set at 20 grams per day, which computes to just 80 kcal out of entire intake of 2000 kcal, or less than 5% of the total kcal intake. And when intake is increased gradually to 50 grams of carbohydrate, carbohydrate intake is only increased to about 10% of total kcal intake. This compares to the 50% of total kcal intake that carbohydrates provide in the typical American diet. Because carbohydrates are so low in the diet, the very low carbohydrate diet is actually a high fat diet! But most nutritionists feel that very low carbohydrate diets actually work, to some extent, because most kcal in our diet are supplied by carbohydrates, and when you eliminate carbohydrates, you eliminate total kcal from the diet. Therefore, lower energy intake occurs on this diet. I have known several colleagues who like and prefer the very low carbohydrate diet and have used it to lose weight. They will follow the low carbohydrate diet for a month or two and then cycle back onto their regular diet. Therefore, if the low carbohydrate diet appeals to someone, I applaud their use of this diet. Several well known nutritionists have written negative reviews of the very low carbohydrate diet. Yudan, J and Carey, M. The treatment of obesity by the High-fat diet – the inevitability of calories. Lancet (Oct 29, 1960) pp. 939-941. The negatives and positives of the very low carbohydrate diet are listed on the table. The high protein diet provides at least 30% of kcal from protein and if possible more. 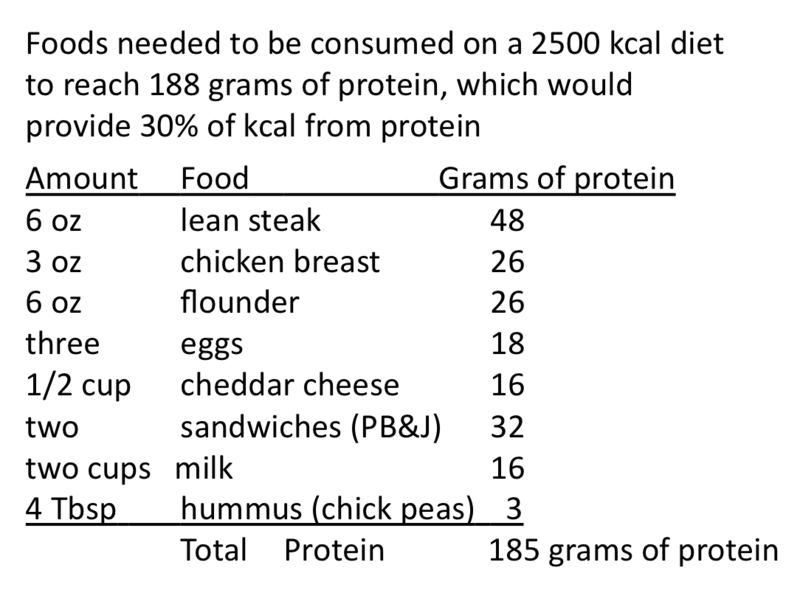 Consuming 30% of kcal from protein sounds reasonable, but in reality it is difficult to obtain this much protein in the diet due to the naturally low content of protein in most foods. Another difficulty is that there are a limited number of protein rich foods, which leads to boredom when eating this diet. Also, a protein supplement often needs to be consumed to reach enough protein. The biggest plus of the classic high protein diet is that there are ample carbohydrate kcal in the diet that can be used for energy and to restock glycogen stores. The very low fat/high carbohydrate diet is supported by several well respected medical authorities for the treatment and prevention of cardiovascular diseases such as CHD. Because this diet only contains about 10% of kcal from fat, the majority of kcal must be provided by carbohydrates. Therefore, the low fat diet is, in fact, a high carbohydrate diet. But the carbohydrates are derived from whole grain products. Also, there is a high intake of fruits and vegetables, so this diet also contains high fiber. Because of the composition of the diet, it is nutrient dense. The main problem with the low fat/high carbohydrate diet is that it provides low satiety due to the low fat content in the diet. Therefore, although there is no doubt that it is heart healthy diet, it is difficult for many people to stay on the very low fat/high carbohydrate diet. However, there are certain people who enjoy this diet and remain on it for their entire adult lives. The Mediterranean diet is in the far right column in the table, and this diet was first promoted in Ancel and Margaret Keys’ cookbook, “How to Eat Well and Stay Well the Mediterranean Way” (Doubleday, 1975). I will discuss the Mediterranean Diet in detail in the last chapter of this book. But if you look through the table, you will see that the Mediterranean diet maintains the approximate macro nutrient percentages of the typical American diet, but the ingredients and methods of food preparation are totally different. An important aspect of the Mediterranean diet is that it is a high fiber diet. Also, a recently published clinical trial confirmed that the Mediterranean diet was protective against diseases of the heart. 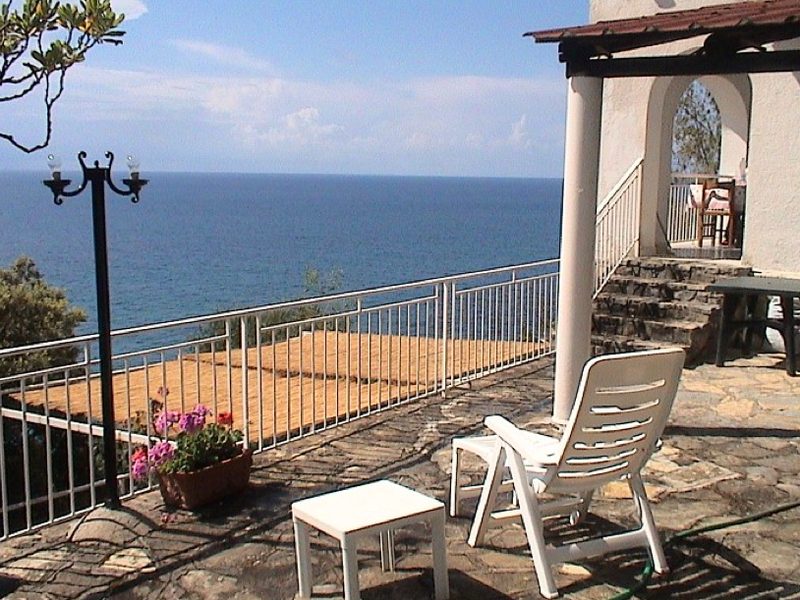 I will discuss the Mediterranean diet in detail in the last chapter. Since the diets presented in the table are based upon different variations in macronutrient content, I would like to discuss each of the macronutrients individually. What Fats Should Americans Eat? As discussed in an earlier chapter, there are over 10,000 different lipid species inside a cell. Therefore, a logical overriding strategy would be that humans should consume as wide a variety of fats from a wide range of foods as possible. In previous chapters I discussed the most important functions of fats and cholesterol, but I was unable to cover every function they serve in the body. I also did not provide structures for the various lipid groups. It is not the purpose of this book to cover every aspect of lipid metabolism. In order to be exposed to a wider explanation of the functions of lipids and see their drawn structures, a recent book by Dr. Glen Lawrence would be a good place to start. The Fats of Life: Essential Fatty Acids in Health and Disease [Paperback] by Professor Glen D. Lawrence, Rutgers University Press, 2013. The next figure illustrates that humans should obtain nutrients, including fats, from many food sources. The figure also shows why certain foods have a particular fatty acid composition. The algae on the left are one of the main sources of food for fish and other marine life. Algae are photosynthetic organisms and use photons from the sun to incorporate CO2 into cell molecules including lipids. Many different fatty acids are synthesized in algae but a large percentage are PUFA, including the omega 3 fatty acids EPA and DHA. Since ocean algae live their whole lives in the very cold ocean, it is important for their membranes to remain fluid and not to harden and freeze up. For this reason, algae incorporate EPA and DHA into the phospholipids of their cell membranes. When fish consume algae they receive high amounts of omega 3 fatty acids. Since fish cannot make their own omega 3 fatty acids, they utilize the omega 3 fatty acids from the algae for their own membranes. This allows the fish, too, to live in the cold ocean. Therefore, the fatty acid composition of fish resembles the fatty acid composition of the algae they eat. Also, this is the reason why fish caught in the ocean are healthier than fish that are farm raised and fed grains as food. Terrestrial plants also live exposed to harsh environmental conditions (temperatures vary from -40 °F to 110 ° F ). As with algae, plants use photosynthesis to synthesize fatty acids from CO2. Most plants have the enzymes necessary to synthesize PUFA, especially omega 6 fatty acids. However, different from algae, plants have limited capacity to synthesize large amounts of omega 3 fatty acids. Therefore, although plants are good sources of PUFA, they are not good concentrated sources of omega 3 fatty acids. In the figure the overall content of PUFA falls from about 70% in algae to about 30% in plants, although this depends upon the specific plant studied. When humans consume meat they consume the fatty acid pattern that is found in the animals from where the meat was derived from. In general, the fatty acid composition can vary based upon what the farm animals were fed. However, the fatty acid content of meat is usually more saturated and contains smaller amounts of PUFA. The monounsaturated fat content of the fat can vary considerably. 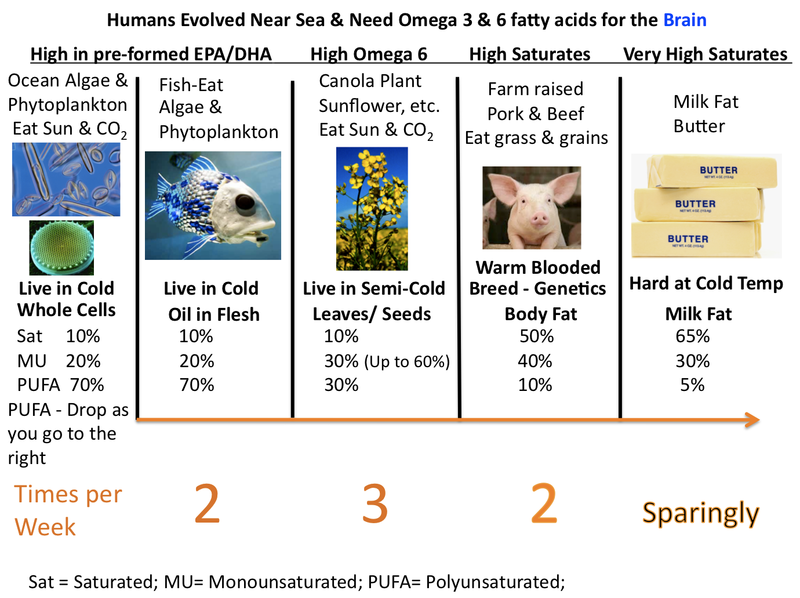 Quite interestingly, the fatty acid content of animals that are free living and hunted by hunter-gathers often contains higher levels of PUFA than animals raised on a farm. Finally, the fatty acid composition of cow’s milk is the most saturated of any other common food. The reason for this is that milk contains higher levels of saturated medium chain fatty acids, which may be better for digestion and utilization in young animals, including humans. Since omega 3 fatty acids are so important for the brain, it is probably an excellent strategy to get a considerable amount of our dietary fats from sources on the left side of the figure. These sea foods are rich in PUFA including omega 3 fatty acids. However, there are other foods available that supply PUFA, and these are the land based plants. Early humans also relied upon whole grains and these should be included in the diet for both their fiber and PUFA. From what we know of Ancel Keys’ “Seven Countries” study, it is probably reasonable to obtain fat from the sources on the right side of the figure less frequently, although they can certainly remain in the diet at lower levels. Algae – May become an important food source of omega fatty acids for humans some day! Who knows? Meat – Eat as a condiment and maybe as a main source occasionally– Eat no more than 2 times a weeks as a main course. White meats are better than red. Chicken can be used as a main course. Dairy – Eat sparingly – especially butter, which is concentrated milk fat; Eggs are a great sources of protein (6 grams per egg) – if you eat 2 eggs, only eat one yolk! As long as you follow the above simple rules, you will not need to count the grams of fat that you are eating in your diet. The above figure presents an improved way of looking at fat. We need to stop talking about Low Fat/High Fat in the diet. It is the type of fat that will either protect you, or lead to, after decades, to a multitude of chronic disease conditions! If foods from all of the sources shown in the figure are eaten, then a wide range of different fatty acids and lipids will be consumed. Since most of us consume enough protein, I have decided not to have an extensive protein section. Nutritionists believe that it a sensible to boost protein intake up to about 20% of total calorie intake (up from about 16%) to help maintain body weight. For most of us this involves boosting our protein intake by 25 grams per day! This is not as easy as it sounds, as protein rich foods tend to be more expensive. Reasonably priced protein bars (some providing 10 grams of protein per bar) can be used for a quick high protein snack. Consuming the Zone or High Protein diet is another story completely. Boosting dietary protein kcal even further, up to 30% of total calorie intake from protein, is difficult and takes planning and determination. Most people following this strategy must use protein supplements or the consistent consumption of high protein sources such as meat and fish. In order to understand how much protein this is compared to what is normally eaten, below is a short review of how much protein our body needs, how much is recommended, and how much most Americans consume per day. Certainly it is possible to eat the high protein foods listed on a daily basis, but it may be difficult to keep this diet up for more than a couple of months due to the monotonous nature of eating similar foods every day. However, there are people who like to eat a high protein diet, and when designed properly, the high protein diet may be effective for weight loss because total calories will decrease as one becomes disenchanted with consistently consuming high protein. 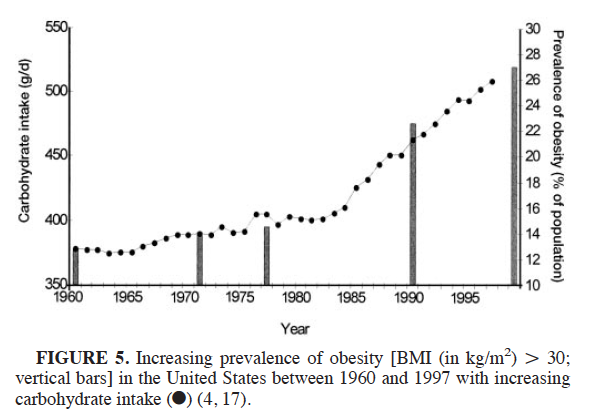 The intake of carbohydrates has increased during the period that obesity rates have increased. Earlier I showed that per capita consumption of corn sweeteners increased 4 fold from 1970 to 1997. Consumption of carbonated soft drinks also increased during this time. 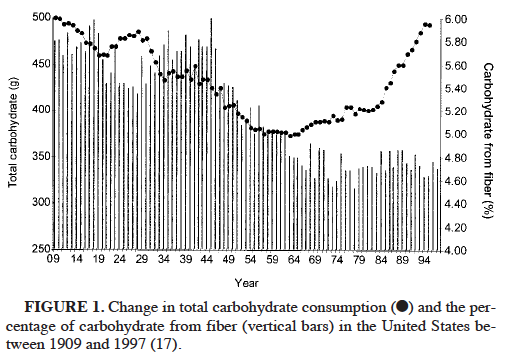 Let’s take a closer look at carbohydrate intake during the increase in obesity rates. Total energy intake remained fairly constant until 1980 (data not shown). After 1980 total energy intake gradually increased until it reached approximately 500 kcal/day. Increased consumption of carbohydrate was the main contributor (428 kcal; about 80% of the increase). The remaining increases came from protein (12%) and fat (8%). During a 20 year period, the increase in consumption of dietary carbohydrates went from 48% to 54% of total energy intake while dietary fat fell from 41% to 37% of total energy intake. Lee S Gross, Li Li, Earl S Ford, and Simin Liu. 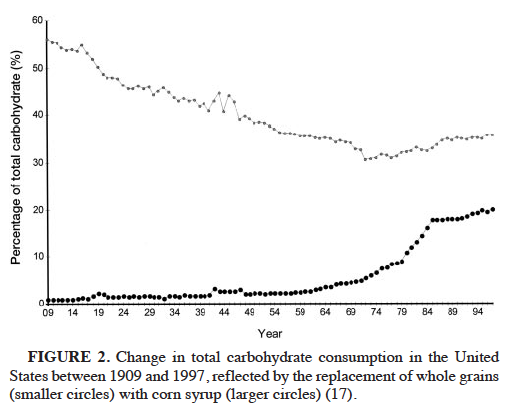 Increased consumption of refined carbohydrates and the epidemic of type 2 diabetes in the United States: an ecologic assessment. Am J Clin Nutr 2004;79: 774–9. The data from Gross and colleagues above certainly point a powerful suspicion on the increased intake of simple sugars as an important contributor to the obesity epidemic. As we discussed in an earlier chapter, many changes were occurring during this period of time. As Michael Moss described so eloquently in his book, “Salt Sugar Fat: How the Food Giants Hooked Us,” published in 2013 by Random House, food companies started to add sugar and other sweeteners to their products in order to improve their bliss point, where the food becomes highly desirable. Also described by Mr. Moss, food companies used the strategy of expanding product lines in order to provide a wide array of super palatable foods that fit every niche and are absolutely irresistible. Certainly staying away from sugar and other sweeteners such as high fructose corn syrup would decrease the total kcal consumed. Let’s discuss a study that tested several important diets. Study Design. The study was a 1-year randomized trial of the dietary components of the Atkins, Zone, and Ornish diets. Participants (160 individuals, about 50:50 men:women) were enrolled in the study conducted in Boston, MA. Each group contained about 40 individuals. Enrollees were adults of any age who were overweight or obese with a body mass index between 27 and 42. Each participant had to have at least 1 metabolic cardiac risk factor in order to provide motivation. The participants were taught the diets through 1 hour meetings on 4 occasions during the first 2 months of the study. A dietitian and physician described the diets and gave general advice on how to adhere to each diet. Written materials and an official diet cookbook were given to each participant. During the course of the study, food intake was monitored using 3-day food records at baseline, 1, 2, 6, and 12 months. After a year in the study, the mean weight loss was similar across all the diets. At 1 year, weight loss averaged about 2-3 Kg per person, or only a mean weight loss of about 2-3%. Also, the 1 year discontinuation rates were: Atkins, 48% stopped; Ornish, 50% stopped; and Zone diet, 35% stopped. So the Atkins and Ornish diets appeared harder to stay on, and more people adhered to the Zone high protein diet. The above weight loss figures were means for the groups. However, individuals did have successes. Three individuals on the Ornish diet and 1 person on the Zone diet lost more than 20 Kg of body weight, whereas no one on the Atkin’s diet lost this much weight after one year in the study. Unless one adheres to a diet, the diet will not succeed, no matter which diet it is. Therefore, one must conclude that rather than following a prescribed diet, one might be more successful following a healthy lifestyle! This was the exact conclusion that Ancel Keys came to and what he and his wife, Margaret, wrote about in their book, “How to eat well and stay well the Mediterranean way,” published by Doubleday in 1975. The authors also indicated that the above negative changes could be reversed if children watched less than 2 hours of television per day. I repeat the above observations because it is interesting that the two-hour time point seems to be an important time mark for causing physiological changes in children. But what is just as interesting is that the two to 2.5 hour time point appears to be important in causing physiological changes in adults, too. In my nutrition and health class, students always ask about the role of structured exercise (done in a gym or at home on a treadmill, etc.) in treating obesity. I let them figure it out for themselves. I give them an assignment where they calculate their daily energy expenditure and I have them list their favorite activities/exercise and list the kilocalories (kcal) expended per hour during each activity. Then I have the students list their favorite snacks with the kcal each one has. The reaction to this assignment has been consistent every year for the past ten years: “I can’t believe how long I need to exercise to burn off the kcal in my favorite snack!” It is just too easy in today’s environment to eat excess kcal! The take home message from this assignment is that structured exercise is not a way to treat or prevent obesity, unless you have enormous amounts of time to spend in the gym (say 3-4 hours per day). I haven’t met anybody with that kind of time yet! 4) keep skeletal muscles from dissolving away with age. But exercise is very important in helping us maintain a healthy body weight. 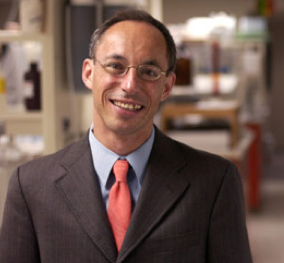 Dr. James A. Levine of the Mayo Clinic has spent a good part of his career researching and promoting the role of Non-Exercise Activity Thermogenesis (NEAT) in influencing a person’s body weight. What is NEAT? NEAT is the energy we expend each day in every day activities such as walking, standing, cleaning the house, taking public transportation to work, walking the dog, standing instead of sitting, taking the stairs, and playing with the kids. Dr. Levine has used state of the art measuring devices in his studies of people’s everyday activities, and he has determined that people who are able to maintain a healthy body weight expend approximately 2.5 hours more NEAT per day than people who have difficultly maintaining their weight. Levine JA, Vander Weg MW, Hill JO, Klesges RC. Non-exercise activity thermogenesis: the crouching tiger hidden dragon of societal weight gain. Arteriosclerosis, Thrombosis and Vascular Biology 2006: 26: 729-736. Why is NEAT more helpful in maintaining weight than structured exercise? Because we do NEAT more often! This is shown in the following figure. In the figure, several examples of energy expenditure are given for the same sized man. The blue-collar worker expends more energy per day than the worker who sits at a desk all day. 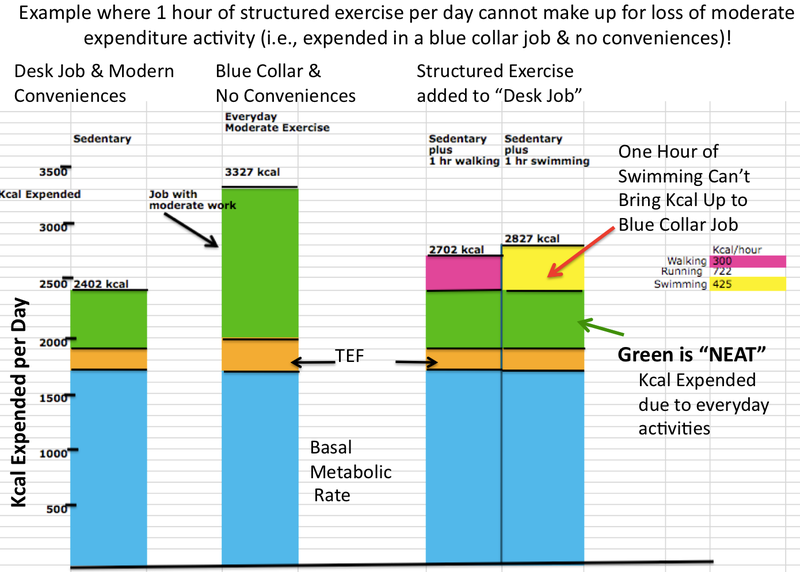 Even adding 1 hour of swimming per day to the desk worker’s total energy expenditure does not bring the total kcal expended for the desk worker up to that expended by the blue-collar worker. Most people who perform structured exercise regularly do so only about 4 hours per week or less. People who perform greater than average NEAT do so every day/7 days a week! On average, a person who expends a large amount of kcal in everyday activities will burn 500 more kcal per day than a person with a similar body type who does little NEAT per day. The reason for our lower levels of NEAT today are due to many reasons- jobs where we sit all day in front of a computer, no need to hand wash the clothes and hang them out to dry, driving to the supermarket instead of walking or having to hitch the horse to the buggy. The reasons are numerous because of all the work saving devices that have been introduced into modern day society. And then there was the introduction into the home of the two major digital systems in the late 1900s: cable TV, large screen televisions, VCRs, and the remote control devices that led to longer hours of inactivity, and easy to use and more powerful desk top computers that also nailed people’s rear ends to chairs. Dr. James Levine, in a series of brilliant studies, documented the role of NEAT (i.e., the lack of it) in the obesity epidemic in the US. See his articles through the links below! How do we increase NEAT in our everyday lives? It’s easy but hard. By this I mean all we have to do is to reverse what we have done to decrease NEAT in the past 45 years. But giving up our digital devices and other work savers requires a conscious decision not to benefit from all of these modern conveniences. Here are some suggestions. The first thing is to throw out the television set. There is nothing that causes you to sit and not move more than watching television. If you do not wish to part with your TV, then an alternate would be to throw out the couch and replace it with a treadmill. However, most people do not use their treadmill no matter what! Another way to increase NEAT is to walk to work and/or use public transportation. This will provide 30 to 90 min per day of exercise depending upon your commute circumstances. If it is impossible to commute from where you live – move! And the act of moving will boost your activity level right there and then! Another way to increase NEAT is to get a job where you need to walk around. Again, you need to be committed in order to get that NEAT! If you do not want to change jobs, consider installing a treadmill desk in your office. In fact, there are directions on how to build your own treadmill desk on the Internet! And you can get exercise in the building process! There are numerous ways to increase NEAT in your life! What is structured exercise good for? Is it important? In the last chapter I discussed how fatty acids (the body’s gasoline) are mobilized from adipose in order to be used for energy by tissues like the heart. But it turns out that fatty acids and other lipid species are used in cells for many other purposes than just energy. Just like all the different pieces that one finds in a box of Lego® bricks, all the different lipids in the cell can be used in intertwining ways to build any structure needed. One of my favorite lipids is found in the inner membrane of the mitochondrion. This membrane contains a relatively large quantity of an interesting lipid called cardiolipin, which is not enriched in any other membrane. The inner mitochondrial membrane is involved in producing ATP for the cell and it needs to be impermeable to hydrogen ions. Therefore, cardiolipin is what I call the electrical tape of the inner mitochondrial membrane. It is highly stable molecule that deflects both hydrogen ions and electrons well. Of course, biology would develop such a useful building block by utilizing the perfect lipid for this specific function. 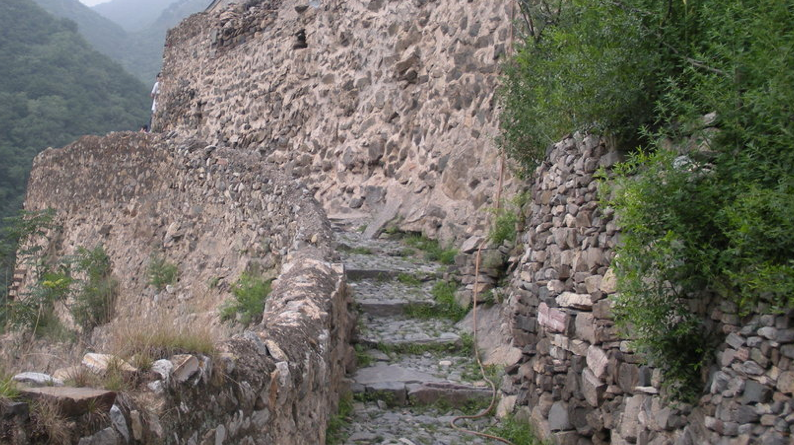 If proteins are the houses and factories of the cell, and cholesterol is what makes membranes much stronger, then lipids are the stones that make up the walls and roadways of the cell, like the stones used in the following picture. 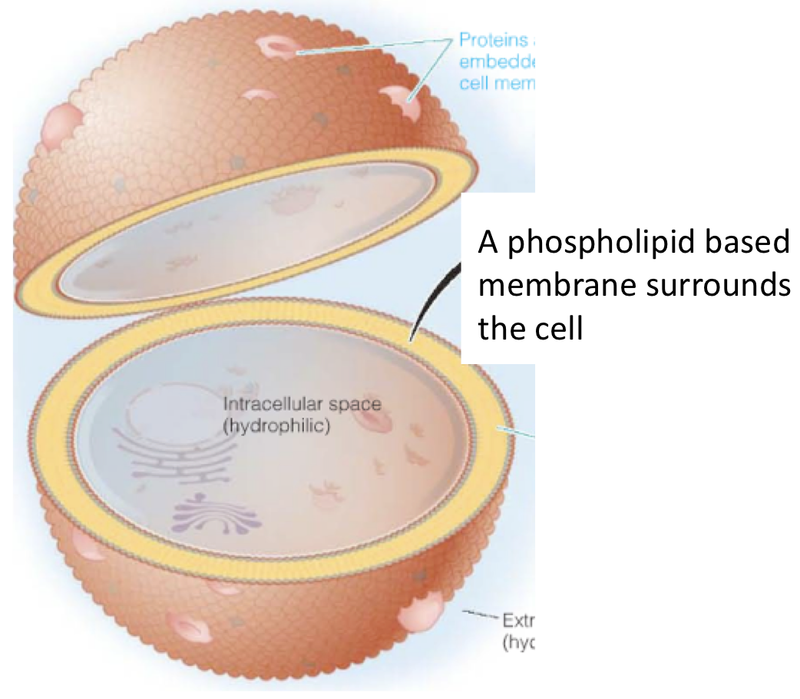 A more conventional picture of how lipids form the cell membrane and surround a cell completely is shown in the following figure. Scientists who study lipidomics, a specific field in lipid metabolism that relates to the vast diversity of lipids in biological systems, have discovered that there are over 10,000 distinct lipid species within a cell. But it is quite possible that there are many more lipid species than this. The fact that there are so many different lipids in cells leads to the basic concept that the more types of lipids that are present in the diet the better, because the lipids in our food, especially a large cornucopia of fatty acids, can be used in many different ways. Therefore, in addition to providing energy, a wide variety of lipids are used for Structure and Communication. There are a wide variety of lipids that probably contributed to human development. Valuable information about who we are today, and what kind of diet may be most suited for optimal health and maintenance of body weight, can be obtained from studies of the development of early humans. Research performed in the last 10-15 years has documented that all humans living today are descendants from a small group of humans who lived and developed in Africa. This particular group of modern humans possibly lived on the coast of southern Africa 190,000 to 100,000 years ago. 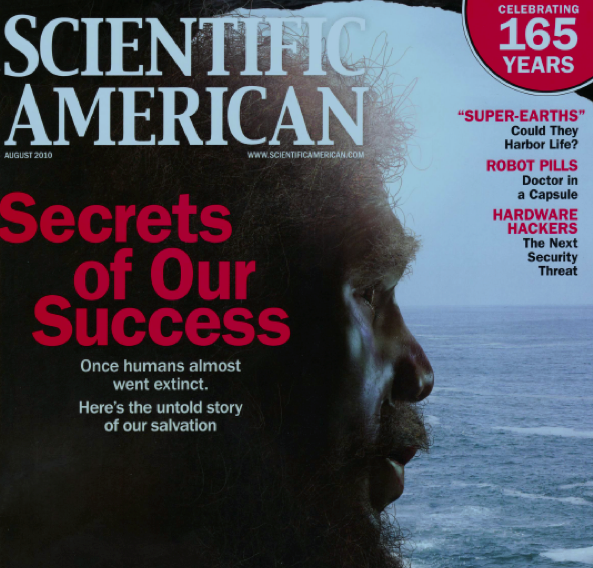 In an article in Scientific American, Curtis Marean, a professor at the School of Human Evolution and Social Change at Arizona State University, addressed the observation that modern humans display very low genetic diversity compared to other species, a fact that suggests that there was a population “crash in early H. sapiens.” In 1991 Dr. Marean began to investigate caves that may have supported early H. sapiens during a long glacial period that lasted until about 120,000 years ago. 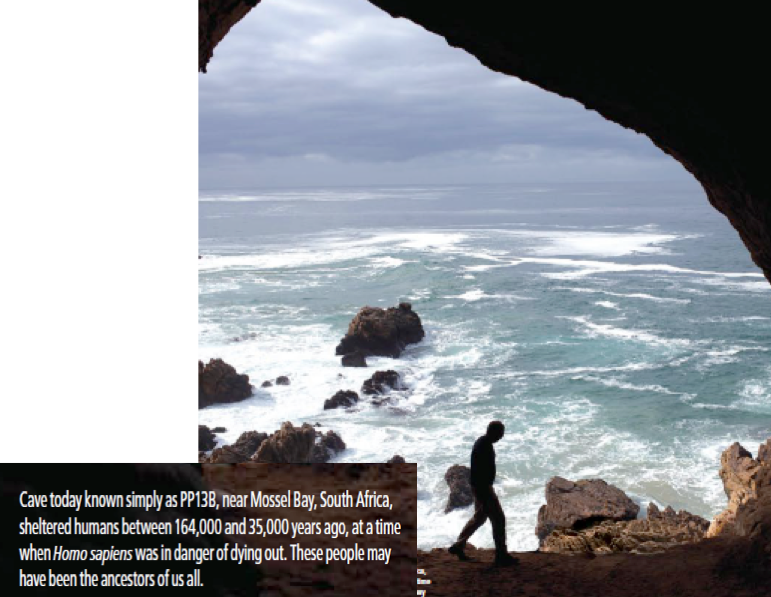 Dr. Marean discovered an interesting cave, called PP13B, near Mossel Bay, South Africa. He found evidence that this cave was used by Homo sapiens from between 164,000 and 35,000 years ago. While other small groups of Homo sapiens may have died out in other parts of Africa due to the cold and adverse conditions brought about by the return of cold weather and glaciers between 195,000 and 123,000 years ago, this group of humans obviously survived. One advantage this group of humans had was that they had quick access to rich seafood because the cave looked out over the ocean. Also, they lived close to a diverse population of plants, including those that contain tubers, bulbs and corms with rich stores of carbohydrates. In the sediments of the cave, Dr. Marean discovered a diverse group of shells from shellfish harvested from the ocean. He also discovered a multitude of stone tools. Dr. Marean has proposed that the genetic, fossil and archaeological data indicate that this cave, and other caves near by, may have been the site where modern humans survived the return of the glaciers and developed before leaving Africa around 50,000 years ago. Also, because these humans consumed seafood as a major source of high quality protein, they also consumed omega 3 fatty acids that are present in seafood. Over this entire period of time, it is quite possible that the brains of these early humans were developing and becoming more capable of advanced thought. The development of the human brain in a geographical location that provided a source of rich high quality protein and omega 3 fatty acids may explain the fatty acid composition of our brains today. 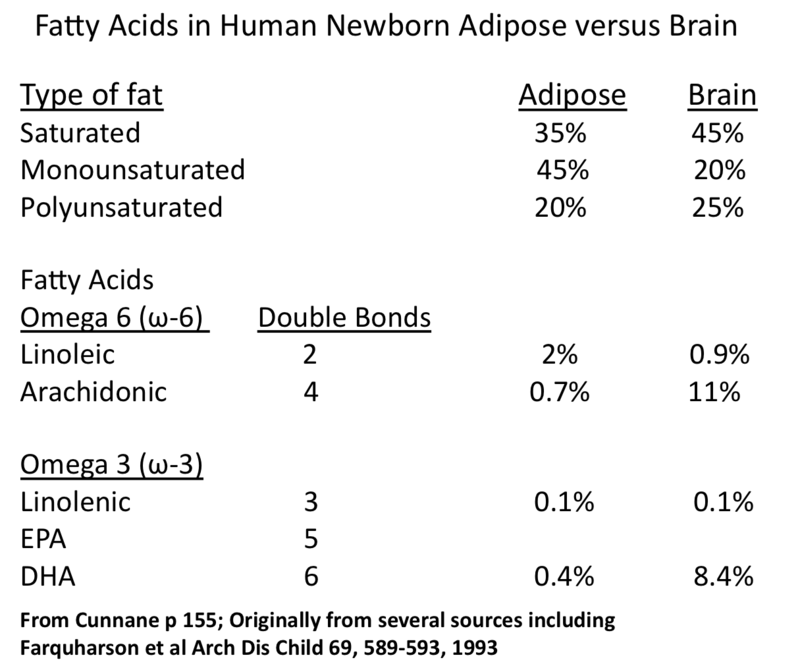 The following table displays the fatty acid composition of human newborn adipose tissue and compares it to the fatty acid composition of human newborn brain. The differences in fatty acid content are startling! The human brain has greatly increased concentrations of arachidonic (omega 6) and docosahexaenoic (omega 3) acids compared to adipose and other tissues such as liver and muscle. These are fatty acids that are highly unsaturated (contain multiple double bonds each). Obviously, as the brain is greatly enriched in these fatty acids over adipose tissue, there must be an important reason for this enrichment, and there also must be a mechanism that directs the enrichment of these fatty acids in brain. Because to the best of our knowledge, omega 3 fatty acids were high in the diet when the human brain was developing and improving, there is a major hypothesis that a sufficient content of omega 3 fatty acids is required in our diet today in order to have the optimal mixture of fatty acids for brain development. We can only speculate right now that because our brains have a very high content of arachidonic and docosahexaenoic acids, that these fatty acids play a special function in the brain. But if there was evidence that a deficiency of these fatty acids causes some kind of detrimental situation, and that increased consumption causes a positive effect, then this would strengthen arguments indicating that these fatty acids play an important role in brain. And in fact, there are now very strong epidemiological data that PUFA, especially those that are found in fish oils, are highly beneficial to human health in several important ways. The health benefits of omega 3 fatty acids has been the subject of hundreds of articles in the scientific literature. One interesting area studied is the effects of omega 3 intake on depression in different populations based upon easy access to fresh seafood. Studies have suggested that the consumption of fish on a regular basis is protective against depression. A meta-analysis of 47 clinical research trials testing the efficacy of treating patients with various brain related disorders with different omega 3 fatty acid administration protocols was published in 2014. In the studies that specifically tested omega 3 fatty acids on clinically defined depression (11 studies), and in less rigorously defined depression (8 studies), a significant improvement in symptoms was noted in patients who consumed additional EPA compared to patients who received the placebo or DHA alone. This meta-analysis was more positive than the previous meta-analysis that was published. The authors stated that their study took advantage of several very recently conducted clinical trials that increased the total number of patients enrolled in the overall analysis. The observation that treatment with EPA was effective whereas DHA was not effective is difficult to understand at this time as the biochemistry indicates that DHA is present in the brain at much higher concentrations than EPA. The authors of this meta-analysis suggested that it may be the anti-inflammatory properties of EPA that are protective, and not the role of omega 3 fatty acids as structural molecules in neurons. Also, the time of life when increased omega 3 fatty acid intake is required by humans may also be an important factor. DHA is known to be especially important for brain development during gestation and during the first several years of life. Grosso G, Pajak A, Marventano S, Castellano S, Galvano F, Bucolo C, Drago F, Caraci F. Role of omega-3 Fatty acids in the treatment of depressive disorders: a comprehensive meta-analysis of randomized clinical trials. PLoS One. 2014 May 7;9(5):e96905. We are getting to the point where the data on the positive contributions of omega 3 fatty acid consumption to overall health is fairly convincing. There are areas where omega 3s are not as helpful as originally proposed, but certainly the studies that show improvement in depression show there are other areas where omega 3 fatty acids are required for specific physiological functions. With the availability of pharmacological omega 3 fatty acid products, we will soon have more information on the efficacy of omega 3 fatty acids. Whereas increased omega 3 intake was shown to be beneficial in depression, positive effects of omega 3s have not been observed with coronary heart disease (CHD). The most recent meta-analysis study showed that neither omega 3 intake, nor supplementation with omega 3 fatty acids, provided protection against CHD. In the same meta-analysis study, intake of saturated fat and monounsaturated fat were also not associated with CHD. This study suggests that there are other factors in the diet, beside fat content, that are responsible for the protection afforded against CHD by certain diets including the Mediterranean Diet. The results indicating that fats did not influence the rates and outcomes of CHD at first are surprising, but we have to remember that most, if not all, of these epidemiological studies were performed after very, very high intakes of fat, such as those that occurred in Finland, had already come down! ChowdhuryR, Warnakula S, Kunutsor S, Crowe F, Ward HA, Johnson L, Franco OH, Butterworth AS, Forouhi NG, Thompson SG, Khaw KT, Mozaffarian D, Danesh J, Di Angelantonio E. Association of dietary, circulating, and supplement fatty acids with coronary risk: a systematic review and meta-analysis. Ann Intern Med. 2014 Mar 18;160(6):398-406. doi: 10.7326/M13-1788. The endocannabinoids are lipid molecules that are used in the body to send signals from one cell to another. In the brain, endocannabinoids usually transmit a chemical signal from one post-synaptic neuron to a near by pre-synaptic neuron. Endocannabinoids are a family of molecules that are derivatives of fatty acids. 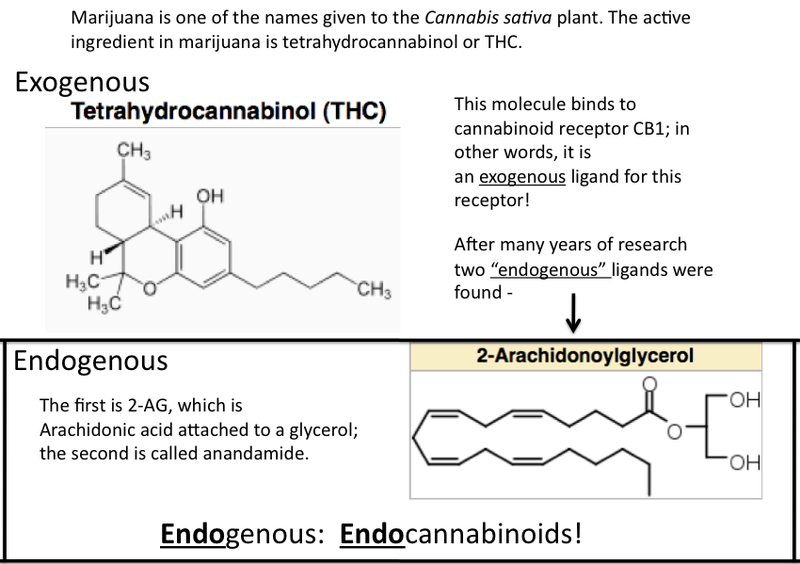 The major endocannabinoids, N-arachidonoyl ethanolamine (anandamide) and 2-arachidonoyl glycerol (2-AG) have the polyunsaturated fatty acid, arachidonic acid, as a central part of their structures. The story how the endocannabinoids were discovered is mind blowing. Marijuana is one of the names given to the Cannabis sativa plant, which has been used for its mind altering properties. The physicochemical properties of marijuana include euphoria, heightened sensory perception, and increased appetite. The active ingredient in marijuana is tetrahydrocannabinol or THC. The many effects caused by marijuana and, THC, caused scientists to ask how it worked on so many systems. Biochemical studies found a membrane receptor (called CB1) on the surface of cells in the brain that THC tightly bound to after marijuana use. The scientists asked the question, if THC, an external substance, enters the brain and binds to CB1 receptors, which then causes many of its physicochemical effects, are there naturally occurring, endogenous compounds that normally bind to the CB1 receptor? After about 20 years of looking for a needle in a haystack, scientists reported that they discovered the endogenous compounds that bind to the CB1 receptor, and they called these compounds, endocannabinoids. The following figure shows the structure of tetrahydrocannabinol (THC) and the structure of the endocannabinoid, N-arachidonoyl ethanolamine (anandamide). 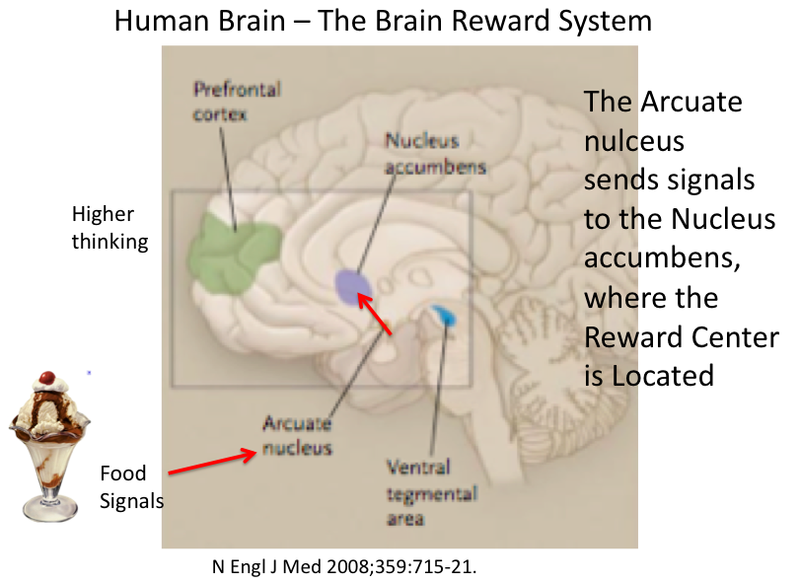 The Brain reward system first occurs in the Arcuate nucleus, where signals (especially those related to food) from different areas of the body are received (See following Figure). Then signals are sent from the Arcuate nucleus to the Nucleus accumbens, where positive neurotransmitters like dopamine are secreted. Soon afterwards, other signals may be sent to the prefrontal cortex, where conscious actions are initiated (for example- go get another slice of pizza). Originally (in early evolution) the brain reward system was used to give pleasurable feedback for when something nutritious was being eaten or when something good happened in everyday activities. Later on in evolution, this system was co-opted and is now involved in addictions and other negative activities. 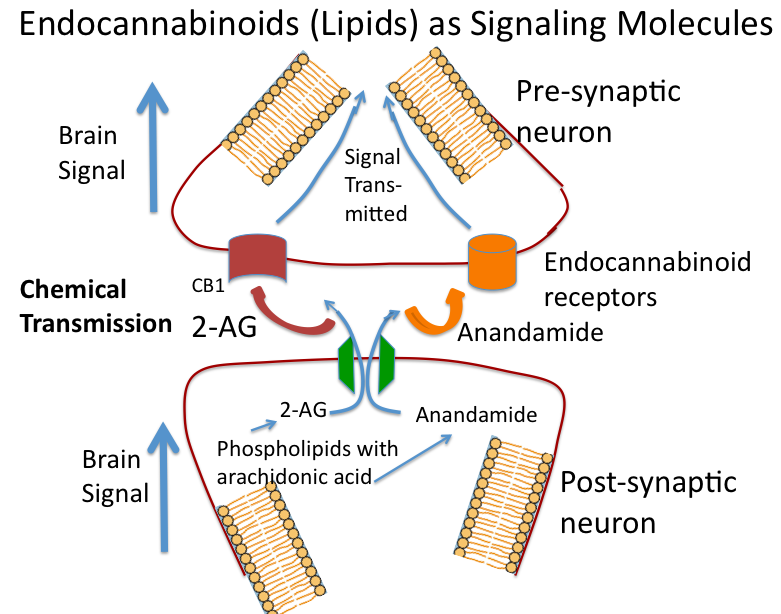 The following Figure shows how endocannabinoid molecules, which are lipids, are transferred from one cell membrane to another cell membrane in order to continue a signal down a nerve tract. Anandamide or 2-AG are synthesized using arachidonic acid molecules that are part of the phospholipids that make up the cell membrane of neurons. When the endocannabinoids are released from the post-synaptic neuron into the space between the two neurons, they bind to the endocannabinoid receptors that are on the pre-synaptic neuron. Next, the receptors initiate signals within the cytoplasm and the pre-synaptic neuron continues moving the signal down the nerve. So What Fats Should Americans Eat? The answer to this question will be found in the chapter where the Mediterranean diet is discussed. A recent study has been published that has shown that the Mediterranean diet can be protective against CHD. Of course, Ancel Keys discovered this in the “Seven Countries” study, and wrote about it. Ancel Keys and his biochemist wife, Margaret, wrote the cook book, “Eat Well and Stay Well the Mediterranean Way,” which was published in 1975. 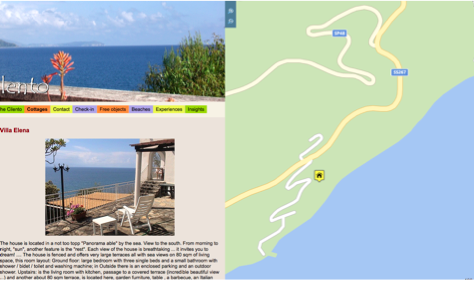 Later, Dr. Keys and his wife moved to southern Italy and practiced the Mediterranean diet up close and personnel. In several articles written after his retirement to Italy, Dr. Keys provided insights into the Mediterranean diet and how it was changing as European countries were recovering their wealth in the period after World War II. But this part of the story will be presented in a later chapter.